The Strom Thurmond High School NJROTC Rebel Cadets came home with a trophy for fourth place overall in the Silver Classic 2013 Drill and Field Meet on Saturday. 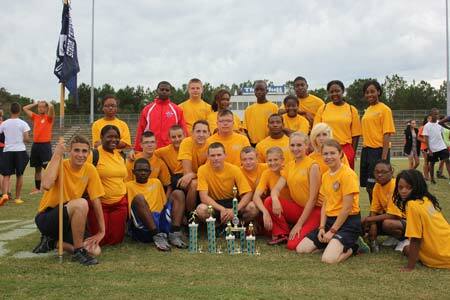 The competition was hosted by Silver Bluff High School and attended by eleven area JROTC units. It included events in armed and unarmed military drill as well as 16 X 100 yard and 8 X 220 yard relay races. In individual events, the Rebel Cadets demonstrated their prowess in military drill by winning a first place trophy in Platoon Basic Unarmed drill, a fourth place trophy in Platoon Basic Armed drill, and a fourth place trophy in the personnel inspection. They also had a strong showing in the field events by winning second place in the 8 X 200 yard relay. Also of note, Cadet Marissa Smart won a medal for team high score in the Air Rifle competition and Cadet Noah Smith won a medal for team high score in the Academic competition. The Rebels’ next drill meet is next Saturday (October 19th) at North Augusta High School.